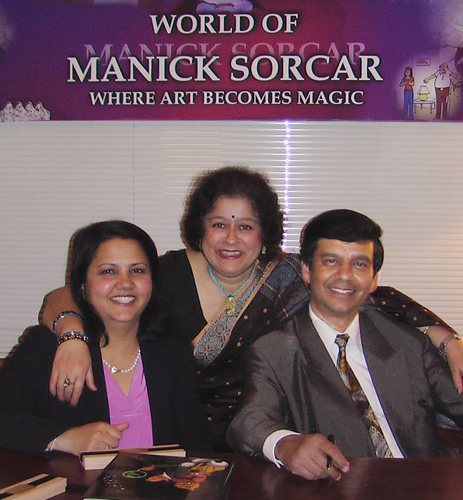 "Indian American animator's laser magic wows US"
Author Roma Sur with Manick Sorcar and his wife Shikha at the Tattered Cover Book Store during the US release of the book "World of Manick Sorcar Where Art Becomes Magic". It was a best seller in Non-Fiction book category at the Tattered Cover Book Store and is a hot seller in Amazon. Manick Sorcar, who has made a name for himself in North America as a laser and animation artist, is being honoured with the publication of a book on his art. The new book comes very shortly after another on his life and work by an Indian American author. In the past few months, the "World of Manick Sorcar - where art becomes magic" has won critical acclaim, with many here praising the book as a long awaited recognition of Sorcar's life and art. Wellington Webb, a former mayor of Denver, Colorado, where Sorcar resides, noted his "unparalled contribution to the skyline of Denver". 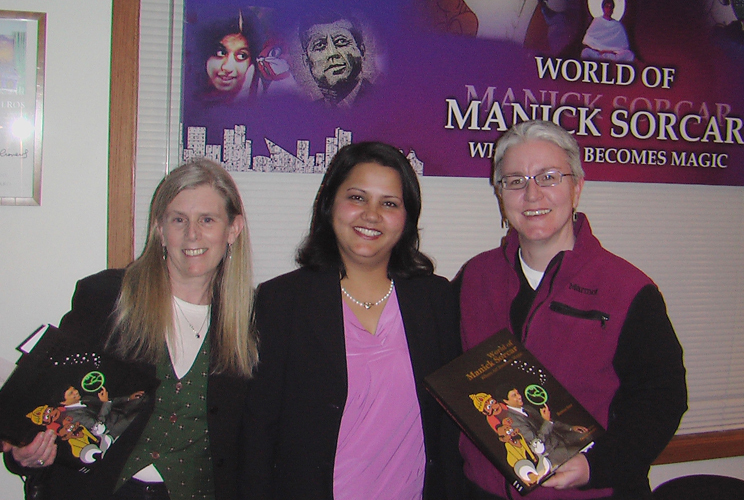 Colorado governor Bill Ritter added, "The world of Manick Sorcar is a compelling one of versatility and triumph and represents the true entrepreneurial spirit of the West." "In the world of laser displays, there are many producers and few artists," said Patrick Murphy of the International Laser Display Association, adding, "He blends the technical skill to wrangle insubstantial light photons, and the artistic skill to create sublime drawings." Sorcar combines his passion for animation with his day job as an electrical engineer. His company has illuminated the Denver international airport, fitness centres in Japan and a palace in Saudi Arabia. According to the book's author Roma Sur, Sorcar has been able to seamlessly merge three different fields - science, fantasy and art "because of his sharp, analytical mind that understands the science behind every piece of art and his childlike imagination that knows no boundaries. Combine that with the magic in his genes, and that is the secret of his mind-boggling creations." "He is a rare personality whose left brain works hand in hand with the right brain - one does not dominate the other. While assisting his late father, (the legendary magician P.C. Sorcar) he realised his flair and interest in lighting engineering. He can create art with a chicken wire, rocks, spices, newspapers -you name it," Sur said in an interview. Readers and critics here appear to have been bowled over by the sheer range of Sorcar's creations as evidenced in the book - from newsclip collages to acrylic on tiles and brick slices, and art on peanuts and rice grains. Sur, who has scripted shows for cable channels like Food Network and Home and Garden, said she was first introduced to Sorcar when she interviewed him for a master's degree project at the University of Denver. "The seed of this book was planted at that time. Since Sorcar's work is so visual, it made most sense to showcase his work in a pictorial coffee table format," she said. The book has been a revelation to even those people who have known Sorcar for a long time. But writing the book has been a revelation to the author too who said she wondered "how could one man be a full time lighting engineer, a gifted artist, an award winning laserist, a world class animator and a cartoonist at the same time?" "I had heard of great Renaissance men like Da Vinci. But I had never actually met someone who so brilliantly combined outsize talents for science and art," she said. Having completed the book, Sur said she was still left with an unanswered question - "When does he ever sleep?"